50 | TH E M R EP O RT O R I G I NAT I O N S E R V I C I N G DATA G O V E R N M E N T S E C O N DA R Y M A R K E T DATA THE LATEST Here are the Cities Where Newer Homes Rule Recent reports may have indicated that new single-family home construction is below its pre- recession levels, but one analysis found no shortage of newly-built homes in several markets. I t seems Meridian, Idaho is the place to move if you're looking for a newer model home. According to a new report from Realtor.com, 34.3 percent of the city's homes were built after 2013. They're affordable, too. At a median price of just $290,000, Meridian's post-2013 con - struction costs come in significantly lower than Realtor.com's other top 10 new home bastions, including Richmond, Oklahoma, where post-2013 homes come in at a median price of $326,000, and College Station, Texas, where they're $345,000. Population growth is likely the reason behind Meridian's big construction boom, with a jump from 35,000 residents to more than 84,000 over the last century. It is now the state's third-biggest city and home to some of Idaho's biggest tech companies and employers. As for College Station, the city is Texas' top job creator, thanks in large part to Texas A&M University. It's also the 15th- fastest growing city in the country, accord - ing to the U.S. Census. 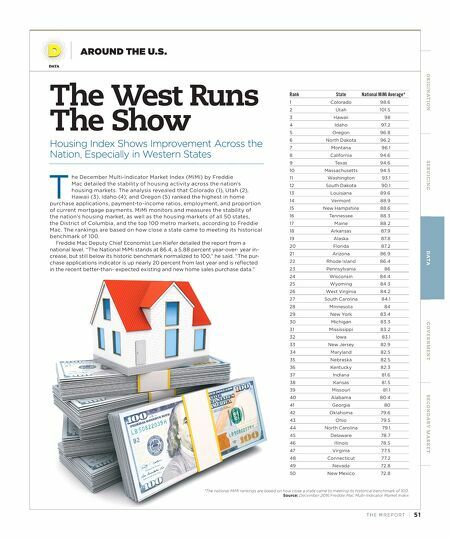 Also making the list for top new con- struction areas were Fargo, North Dakota; Lincoln, Nebraska; Frisco, Texas; Irvine, California; San Tan Valley, Arizona; Arvada, Colorado; and Orem, Utah. For vintage charm seekers, Realtor.com also revealed the spots where the oldest construction in the country can be found, and the Boston-Cambridge, Massachusetts area came in at No. 1 by a mile. With 34.7 percent of homes built before 1900, its his - toric properties boast a median price of just under $800,000. Newark, New Jersey took the No. 2 spot, though its numbers pale in comparison with Boston. A little more than 13 percent of houses were built pre-1900, and median historic home prices are $144,500. The list also included Allentown, Pennsylvania; Hartford, Connecticut; Providence, Rhode Island; Manchester, New Hampshire; Grand Rapids, Michigan; Chicago; Cincinnati; and Milwaukee. 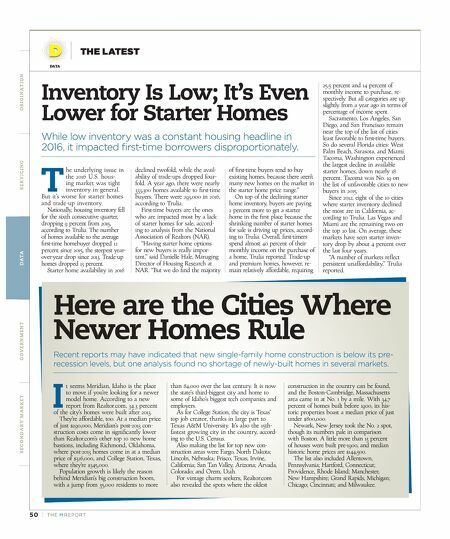 Inventory Is Low; It's Even Lower for Starter Homes While low inventory was a constant housing headline in 2016, it impacted first-time borrowers disproportionately. T he underlying issue in the 2016 U.S. hous- ing market was tight inventory in general. But it's worse for starter homes and trade-up inventory. Nationally, housing inventory fell for the sixth consecutive quarter, dropping 9 percent from 2015, according to Trulia. The number of homes available to the average first-time homebuyer dropped 12 percent since 2015, the steepest year- over-year drop since 2013. Trade-up homes dropped 13 percent. Starter home availability in 2016 declined twofold, while the avail - ability of trade-ups dropped four- fold. A year ago, there were nearly 333,300 homes available to first-time buyers. There were 293,000 in 2016, according to Trulia. First-time buyers are the ones who are impacted most by a lack of starter homes for sale, accord - ing to analysis from the National Association of Realtors (NAR). "Having starter home options for new buyers is really impor - tant," said Danielle Hale, Managing Director of Housing Research at NAR. "But we do find the majority of first-time buyers tend to buy existing homes, because there aren't many new homes on the market in the starter home price range." On top of the declining starter home inventory, buyers are paying 2 percent more to get a starter home in the first place because the shrinking number of starter homes for sale is driving up prices, accord - ing to Trulia. Overall, first-timers spend almost 40 percent of their monthly income on the purchase of a home, Trulia reported. Trade-up and premium homes, however, re - main relatively affordable, requiring 25.5 percent and 14 percent of monthly income to purchase, re- spectively. But all categories are up slightly from a year ago in terms of percentage of income spent. Sacramento, Los Angeles, San Diego, and San Francisco remain near the top of the list of cities least favorable to first-time buyers. So do several Florida cities: West Palm Beach, Sarasota, and Miami. Tacoma, Washington experienced the largest decline in available starter homes, down nearly 18 percent. Tacoma was No. 19 on the list of unfavorable cities to new buyers in 2015. Since 2012, eight of the 10 cities where starter inventory declined the most are in California, ac - cording to Trulia. Las Vegas and Miami are the remaining two on the top 10 list. On average, these markets have seen starter inven- tory drop by about 4 percent over the last four years. "A number of markets reflect persistent unaffordability," Trulia reported.